After vetoing legislation Tuesday that gave him the money to continue his war but required that he accept loose limits of its ultimate duration, the president told the nation, "I recognize that many Democrats saw this bill as an opportunity to make a political statement about their opposition to the war. They sent their message, and now it is time to put politics behind us and support our troops with the funds they need." Bush has made his position clear: Democrats, many of whom rightly argued four years ago that going to war in Iraq would be the huge mistake it has turned out to be, and who have since been far ahead of the White House in identifying the nature of the crisis that has since developed, are now to be dismissed as the players of political games when they advocate for a strategy that would begin bringing U.S. troops home from the conflict on a schedule beginning October 1. That's a remarkable line of analysis from a president whose inability to recognize the flaws in his own neo-conservative vision has rendered his wrong at every turn, and whose determination to play politics with life-and-death decisions has defined not just his approach to the Iraq war but his tenure as president. "Twelve weeks ago, I asked the Congress to pass an emergency war spending bill that would provide our brave men and women in uniform with the funds and flexibility they need," said Bush in framing his veto message. "Instead, members of the House and the Senate passed a bill that substitutes the opinions of politicians for the judgment of our military commanders." The problem with Bush's "I'm-so-above-politics" line is that he has been disregarding advice from military commanders since before the war began. "The President vetoed our troops and the American people," says retired Maj. Gen. John Batiste. 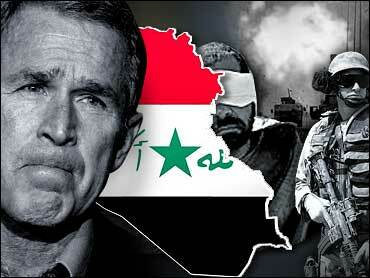 "His stubborn commitment to a failed strategy in Iraq is incomprehensible. He committed our great military to a failed strategy in violation of basic principles of war. His failure to mobilize the nation to defeat world wide Islamic extremism is tragic. We deserve more from our commander-in-chief and his administration." Retired Maj. Gen. Paul Eaton: "This administration and the previously Republican-controlled legislature have been the most caustic agents against America's Armed Forces in memory. Less than a year ago, the Republicans imposed great hardship on the Army and Marine Corps by their failure to pass a necessary funding language. This time, the President of the United States is holding our Soldiers hostage to his ego. More than ever [it is] apparent [that] only the Army and the Marine Corps are at war — alone, without their President's support." Says retired Lt. Gen. Robert Gard: "With this veto, the president has doomed us to repeating a terrible history. President Bush's current position is hauntingly reminiscent of March 1968 in Vietnam. At that time, both the Secretary of Defense and the President had recognized that the war could not be won militarily — just as our military commanders in Iraq have acknowledged. But not wanting to be tainted with losing a war, President Johnson authorized a surge of 25,000 troops. At that point, there had been 24,000 U.S. troops killed in action. Five years later, when the withdrawal of U.S. troops was complete, we had suffered 34,000 additional combat deaths. Others offer a straightforward assessment of Bush's failure as the commander-in-chief. "By vetoing this bill and failing to initiate an immediate and phased withdrawal, the President has effectively gone AWOL, deserting his duty post, leaving American forces with an impossible mission, suffering wholly unnecessary casualties," argues retired Lt. Gen. William E. Odom. Add the public statements of the retired generals together with the behind-the-scenes expressions of frustration from current commanders and they form the most powerful tool that Congressional Democrats have in what will ultimately be a negotiation not with Bush but with the American people — a negotiation that, the president well understands, is about the question of which side is playing politics and which side is listening to military commanders and supporting the troops. House Speaker Nancy Pelosi and Senate Majority Leader Harry Reid should take the message of these retired generals — along with the anti-war statements of thousands of current and returned Iraq soldiers — into the fight with Bush. And, to borrow a slightly impolitic phrase from Senate Foreign Relations Committee chair Joe Biden, they should "shove it down his throat."